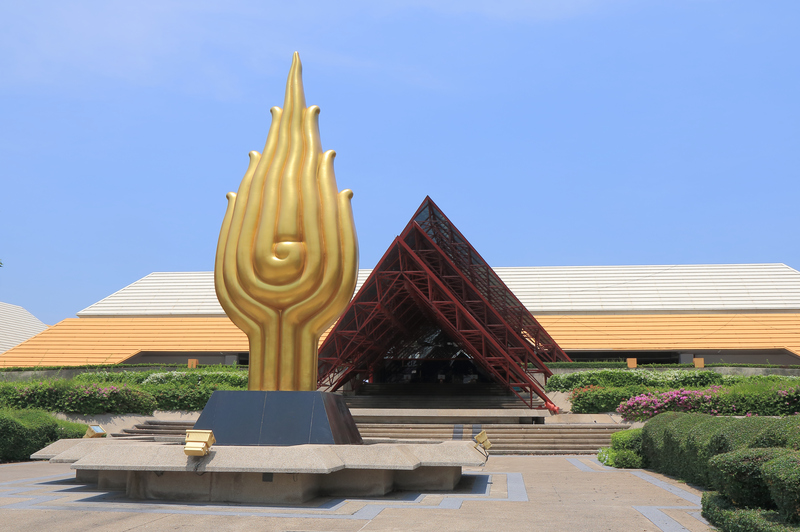 The Queen Sirikit National Convention Centre was builtm originally by the Royal Thai Government to host a World Bank/IMF Annual Conference in 1991. Named after Her Majesty Queen Sirikit in honour of her 60th birthday, the center has spurred a growth in meetings, conventions and expo’s being held in Thailand. The centre reflects Thai culture in it’s architecture and design, and you can find some beautiful work by the Thai artist Chalood Nimsamer at the entrance, named “Lokuttara”. More than 1500 pieces of Thai art are inside the center. The inward sloping exterior walls are traditional Thai architectural forms, and the building is pretty unique when viewed from it’s exterior. The calender for the QNCC is pretty regularly packed with events, mainly expos of various types targeted at both businesses and consumers. Some regular events our guests might enjoy are the Travel Expo, that showcases many Thai and Asian travel agents offering huge deals and discounts on flights, hotels and holiday packages. Also held every year are expos such as the Pet Expo, Book Fairs, and many more. It’s best to check out the QNCC’s website calendar for the dates you’ll be here, and you might find something to check out.